Arrow returns from hiatus to formally introduce the newest addition to the cast and establish what could be a new status quo for the show. The final non-crossover episode ended with the revelation that the new Green Arrow is none other than a child of Robert Queen. Long lost siblings is a fairly common trope in TV shows that run for long enough so on the surface this reveal has every potential to be a bad thing as such plots are often contrived ways to shock the audience of a show that has long since run out of ideas. It could so easily be dismissed as soap opera nonsense as it is often thrown in for shock value. I’m glad to say that this so far isn’t the case with the introduction of Emiko (Sea Shimooka). I’ve mentioned in earlier reviews that the writers of season 7 have done a really good job retaining what viewers expect of Arrow as a show in terms of its formula while playing around with those elements enough to provide something new. There’s a real sense that the show is growing and changing which is a good thing based on the content delivered. Naturally Emiko is a whole new character but her setup is entirely familiar. She has a list, a stubborn desire to cross names off that list without the involvement of anyone else and plenty of emotional baggage motivated by absent family. In essence she is Oliver as he was in the first season with some key differences that relate entirely to her such as not really knowing Robert Queen which motivates the constant chip she has on her shoulder. The fact that season 7 Arrow is a very different show to what it was in the simpler days of season 1 also informs differences in Emiko because the world she inhabits has moved on. It was a good idea to do an episode almost entirely focused on Emiko as understanding her as a person is essential to making her a sympathetic character. We know from prior appearances how skilled she is but there’s a lot to learn about who she is as a person and what motivates her. All told her motivation is fairly simple with her list being made up of those she suspects are responsible for the death of her mother. Vengeance is a simple yet clean motivation that is easy to understand and leaves plenty of room for growth outside of that. At this point in her life Emiko is consumed by that desire for revenge and since she has worked alone up until now she has nobody to help her work through her pain so there’s no way for her to shake herself out of the tunnel vision she has for her mission. This is where Rene comes in. He helped Emiko in prior episodes and clearly supports her mission because she’s doing a lot of good in the city whether she plans to or not. Rene helping her out has made him the closest thing she has to a friend so when she suffers an unexpected injury she takes the calculated risk to trust him enough to ask him for help. She goes to him unmasked which I found to be a little surprising as she could have approached him without unmasking but I can accept the conceit as it was necessary to have them meaningfully interact. Speaking of conceits it’s bizarre that she has suddenly stopped covering her full face now that her identity has been revealed to the audience. There is no reasonable in universe explanation given for why she no longer covers her face nor does it make any real sense for her character given her desire to not be identified. Putting her sudden lack of secrecy aside, her interactions with Rene are great. Rene takes on something of a mentor role as he’s the experienced vigilante who has been where she is so understands what she’s going through in terms of her search for purpose. Before meeting Oliver he was directionless and entirely motivated by the anger felt after the death of his wife. Joining Team Arrow allowed him to channel that anger into positive change for the city, at least for a time. Team Arrow may be no more but the lessons he learned being part of it still stick with him and he looks to help Emiko learn them as well. He gains an understanding of why she feels the way she feels and forces himself into her mission by showing up whether she wants him to or not. At first she’s irritated by eventually she accepts it because he doesn’t give her much choice and eventually opens up to him about the father that abandoned her and the mother that she lost. Their dynamic is interesting with Rene taking on a mentor role but not being in charge of Emiko’s mission. She’s still the Green Arrow and is entirely in charge of that side of things with Rene offering her guidance along the way. Ultimately he helps her realise that working alone will eventually lead to her death because the odds stacked against her are only going to increase. 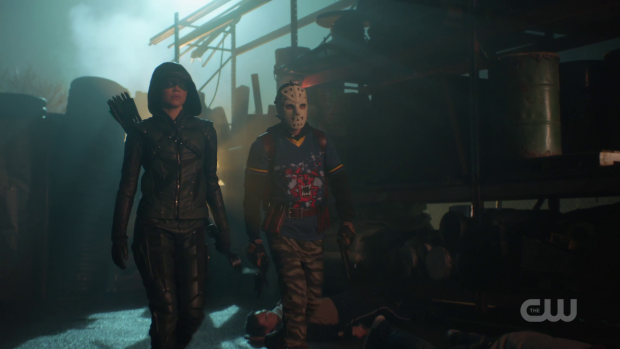 Her acceptance of this at least in the short term provides a natural explanation for a riff on the Arrow formula where a variation of Team Arrow work together to infiltrate a compound of some kind. Emiko and Rene are in the field and Curtis takes on the role of technical support. It’s familiar yet different and works really well because the Rene/Emiko dynamic isn’t quite like anything the show has given us before. Emiko’s first foray into the world of vigilante team-ups isn’t quite enough to convince her that she needs a team but she does become comfortable with the idea of Rene being her partner which makes for a fun reference to the early days when it was just Oliver and Diggle working their way through Oliver’s version of the list. As I’ve said the world of Arrow is very different to what it was in the first season and Emiko is very much a part of that now. She comes in at a time where what she is doing has been done and refined to the point of a near perfect version of that. Of course the team had their differences and went their separate ways. Not to mention the fact that it ended up with Oliver in prison but for a time Team Arrow were incredibly efficient with a group dynamic that certainly felt familial. Rene’s intention is to get Emiko to that point because he knows it works but she isn’t at the point where she’s willing to accept that yet. The good thing is that the evidence exists for her to come to the realisation that doing things alone is far from the best plan. It hasn’t been explained why Emiko has chosen to take on the identity of the Green Arrow though it is suggested that it’s a symbol of her desire to connect to her family. She isn’t at the point where she can approach Oliver to get to know him but it could be that becoming the Green Arrow is her way of connecting herself to her family in some way whether that be conscious or not. Of course the actual reason is that the production team want to have an “old school” version of the Green Arrow in the world of the show because Oliver’s role has changed so much following his release from prison. That way the writers can play with what Oliver is doing now while still having the familiarity of a version of Team Arrow working outside the law. It’s clever and provides an opportunity for varied storytelling. The possibility of developing the show along the lines of eventually replacing Oliver Queen as the Green Arrow was discussed on a recent podcast; I think it’s good to keep that possibility in mind when watching episodes like this. Last season flirted with the idea by having an arc where Diggle took on the mantle and this episode delivers another take on the Green Arrow identity being a legacy rather than belonging to any one person. Emiko taking it on makes it feel almost like a family business but the in universe point is what it can represent. Out of universe the ability to pass on the mantle and have it be accepted is essential for the longevity of the show. “Elseworlds Part 3” set up some sort of sacrificial act by Oliver Queen in next year’s crossover so it could be that the production team are attempting to future proof the show for Stephen Amell’s departure. It’s unclear at this point if Emiko is series lead material but Sea Shimooka’s performance here is incredibly engaging and the character is off to a good start so it’s certainly not impossible that she could get to the stage where she would be a viable lead for Arrow‘s future. Emiko has another thing that Oliver didn’t have access to. She has Oliver even if she doesn’t realise it yet. He will be a great resource for her because he has experience of the solo crusade, knows the toll that it takes and understands why she feels the need to do it alone. Ultimately she will have to choose to let him into her life but that resource is dangled in front of her as an option which is narratively enough for now. Oliver is pushed off to the sidelines in this episode because it is very much Emiko’s story though he does learn about his connection to her and has to react to it. I repeatedly talk about how good an actor Stephen Amell is and this season has certainly given him ample opportunity to prove that. Most of his scenes in this episode have Oliver process what he learned and Amell plays that with a great deal of exhaustion which feels about right considering the litany of hardships that constantly come Oliver’s way. He thought that he had made peace with the sort of man his father was and knew the mistakes he made but the notion of having a hidden daughter and what amounts to a second family that he kept hidden is almost too much for him to endure. Not only that but Walter and his mother apparently knew about this and said nothing to him about it. Moira keeping this from him doesn’t make a lot of narrative sense considering their relationship bit this is the trouble with retcons like this. Some things about the history of these characters has to fundamentally change in order to make this work which is both good and bad in this case. Emiko is absolutely a worthy addition to the show but the circumstances of her existence are noticeably contrived. There is another aspect of this that the episode doesn’t really deal with. Oliver struggles with his father being the sort of man who could abandon a child which makes sense but he really should be questioning why Oliver chose to stay with Thea and Moira rather than leave them for Emiko and her mother. He was apparently all set to start a new life with Isabel Rochev -remember her?- but the accuracy of that is dubious unless you accept a tie in novel as canon. There isn’t actually enough known about Robert to determine how devoted he actually was to Oliver and Thea though it’s reasonable to assume that Oliver would think that he favours them considering his established weakness when it comes to family. There’s a lot of weight to this idea and I hope that this will be explored now that Oliver and Emiko have met. 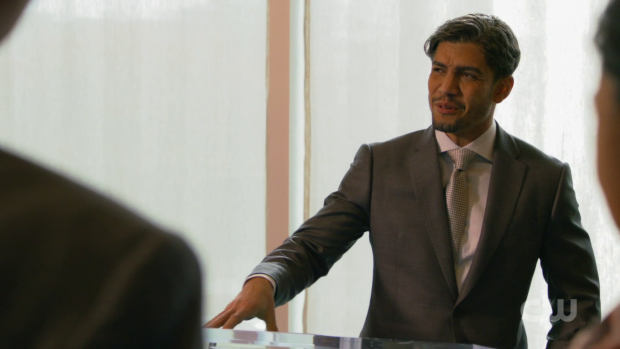 The flash forwards give us our first look at Glades Mayor Rene and he looks very different to what we’re used to. This visual shift sends a clear message that he has been radically altered in this future. All of his key relationships have broken down and he has a very insular view of what he wants to accomplish. It’s a jarring and effective shift that further fleshes out this future world without relying too heavily on exposition and serves as a reminder that there is a great deal of bleakness ahead suggesting that the choices about to be made are bad ones. 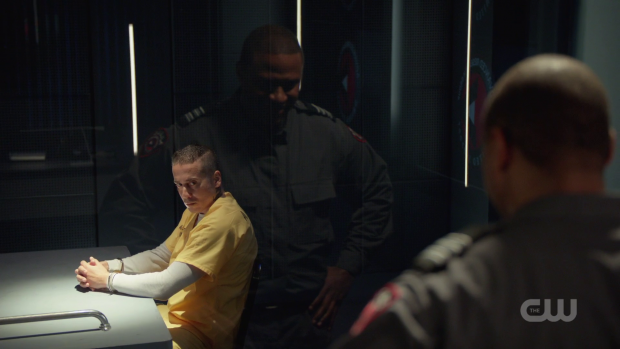 Lyla and Diggle receive some attention with their ongoing attempts to get information out of Diaz. There’s a lot of posturing here but sufficed to say Diaz isn’t willing to cooperate until they offer to enlist him into the new Suicide Squad…or Ghost Initiative. Kirk Acevedo’s talent can’t be denied but I don’t understand the rationale of keeping this character around far longer than any previous villain not named Slade Wilson. It could be that this Ghost Initiative uses this character in fascinatingly different ways that solidifies his position on the show or it could end up being a pointless diversion that prolongs something that has long since run its course. Time will tell. An excellent episode that establishes a new status quo, remixes familiar elements and explores a fascinating new character. The reveal of a long lost sister runs the risk of being dismissed as soap opera nonsense but the writers do good work in this episode to get around that by focusing on Emiko and spending a lot of time establishing what motivates her and how she fits into this world. Sea Shimooka is engaging on the role and having Emiko be a riff on Oliver in season 1 is a really good idea as it allows the show to retain the familiar formula while adding elements that feel fresh by using the world the show inhabits to its advantage. Rene is a natural partner for Emiko because he understands where she’s coming from after going through it himself. Being part of Team Arrow was positive for him so tries to convince Emiko to embrace teamwork even though she’s reluctant. This leads to a partnership similar yet different to Oliver’s partnership with Diggle in season 1. Oliver takes on a more reactive role in this episode as the new knowledge he has a sister hits him. Stephen Amell nails his performance throughout, making some interesting choices when it comes to Oliver’s reaction. He plays him as being exhausted which works considering everything he has had to endure over the years. It has come to his attention on several occasions that his father was far from saintly but having a whole secret family is something else entirely and he struggles to process it. Some narrative gymnastics are performed to flesh the situation out and they don’t make complete sense when really thinking about it but the emotional story is absolutely spot on though the question over why Robert chose to stay with Oliver, Moira and Thea rather than leave them for his other family isn’t even considered. The future plot continues to be compelling with the first appearance of Glades Mayor Rene who is radically different with his key relationships torn apart. Diggle and Lyla recruiting Diaz into a new version of the Suicide Squad is a bizarre choice; it’s still unclear why Diaz has been kept around so long though it’s always possible that this current plot will be the best use of him and be entirely justified.